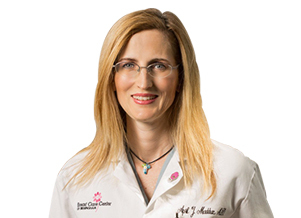 Dr. April Maddux’s practice has evolved significantly over the years with increasing focus on surgical treatment of breast cancer and preventive/prophylactic surgery for high-risk individuals. Urgent appointments can be made for patients with a confirmed or strongly suspected diagnosis of breast cancer; however, our capacity to offer appointments to patients with benign lesions or symptoms not suspicious for breast cancer is very limited. April Maddux, M.D., Birmingham, Al.